Let’s look at a few of the best ways to understand your customers’ voice, and some suggestions on the best way to balance all that information. This number is used by many brands including Taco Bell. The result of this voice of customer research will be your percentage of satisfied customer versus your percentage of dissatisfied customers. Obviously, your goal should be to have as few dissatisfied customers as possible. But, if your number of dissatisfied customers starts to exceed 10%, that can be an indicator of more serious problems in your operation. A net promoter score is more granular than a simple satisfied/dissatisfied response. After all, it’s designed to help you find people who are raving fans of your restaurant and would be willing to recommend it to friends and family. This system allows customers to rank their willingness to recommend your brand on a scale of 1-10 and can be invaluable in understanding how big an impression your restaurant is leaving on its customers. The customer loyalty index was previously very commonly used in the restaurant industry. It allows you to track things like ease of doing business and willingness to buy/use a product again. But you need to weight individual answers, so it’s not ideal. Also, consumers are demanding shorter surveys, making it impractical in some settings. Evaluations help you understand how customers feel about the quality of your restaurant, service, hospitality, and the cleanliness of each location. Generally, each evaluation will be tinged by what matters most to that particular customer. For example, one customer may be triggered by a dirty bathroom while another may be upset about the temperature of their food. It’s impossible to know what will trigger each guest. That’s why your team needs to execute everything at or above standard in the same way every time. Also, keep in mind that two guests may have totally different experiences even if they come in at exactly the same time. This makes it unrealistic to say that it’s not possible for a guest to have a bad experience when your A team is working because we never know how that individual will react to the service they receive. While looking at indices, scores, and metrics can provide broad insights, it shouldn’t be your focus. 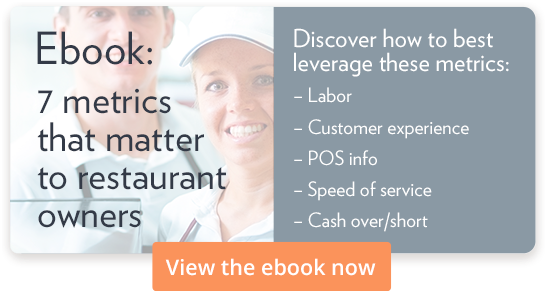 Most inexperienced QSR owners focus on the numbers more than anything else. But, the truth of the matter is that feedback is far more valuable than numbers. If you aren’t receiving enough customer feedback, that’s a sign of other problems. Maybe your cashiers aren’t talking up the feedback programs enough or your guests aren’t having standout experiences that make them want to provide feedback. With so many companies begging for customer opinions, you need to stand out to get a customer’s opinion. Your voice of customer programs have a wealth of information. But, that doesn’t mean it’s the only program you should be paying attention to. The true value of the voice of the customer is when you can blend it with other restaurant metrics such as speed of service, labor reports, ICOS, and scheduling. This will give you a more comprehensive understanding of why you’re getting specific feedback from your customers. The most valuable part of your voice of customer program will always be customer comments. In these comments, they’ll express their true opinions about your QSR. This will give you more detailed, actionable insights than any number can offer. So, keep listening and you’ll benefit from the deep insights your customers bring.